Located in the scenic Laurel Highlands of western Pennsylvania, America's third oldest amusement park, Idlewild, was founded in 1878 as a picnic ground along the Ligonier Valley Rail Road. Its tranquil setting quickly established Idlewild as the premier place for church, school, and corporate picnics, as well as a recreational getaway for families. 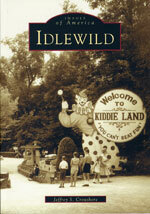 Idlewild added new amusements and facilities as its crowds continued to grow, but it always strove to maintain the picturesque landscape of the site. Soon a fully-fledged amusement park was in operation, with throngs of visitors disembarking the trains from such places as Latrobe, Greensburg, and Pittsburgh. Home to unique attractions like Story Book Forest, the Rollo Coaster, Mister Rogers' Neighborhood of Make-Believe, and the SoakZone, Idlewild has been the backdrop for generations of fond memories. Idlewild's proximity to the Lincoln Highway helped the park survive the abandonment of the railroad, and careful development by the Mellon and Macdonald families and the Kennywood Entertainment Company continue to help it thrive. This collection of photographs tells the story of how one of America's most beautiful theme parks has grown throughout the years. Employed by Idlewild and SoakZone for 12 years, Jeffrey S. Croushore currently serves as a picnic coordinator. In the winter of 2000-2001, he undertook a project to organize and catalogue Idlewild's archives and is now the park's principal archivist.